Many of the problems that we will encounter in this section involve parallel or perpendicular lines. To study this we must focus on the slopes of the lines. reads "m perpendicular". To find the slope of the perpendicular line simply reciprocate the number and change the sign. Find the corresponding perpendicular slope. Of course, just use the same slope if you are asked to find the slope a parallel line. Find the slope of the line perpendicular. 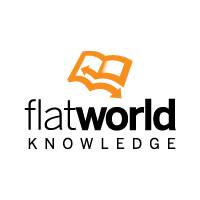 Example: Find the equation of the line perpendicular to y = −1/4 x + 2 passing through the point (−1,−5). This three step process using slope-intercept form always works. 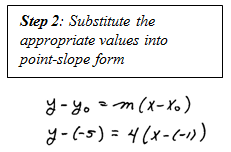 We could find this equation using point-slope form as well as demonstrated below. Example: Find the equation of the line perpendicular to y = −1/4 x + 2 passing through the point (−1, −5). 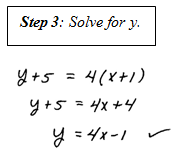 Notice that the answer y = 4x − 1 is the same using either method.